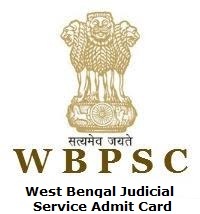 West Bengal Judicial Service Admit Card 2019 is Available Now…!! Good news for the candidates who are looking for the West Bengal Judicial Service Prelims Admit Card 2019. Yes, the West Bengal Judicial Service Hall Ticket 2019 is Released at pscwbonline.gov.in. The West Bengal Public Service Commission authority is going to conduct the West Bengal Judicial Service Preliminary Examination on 28th April 2019 (Sunday). 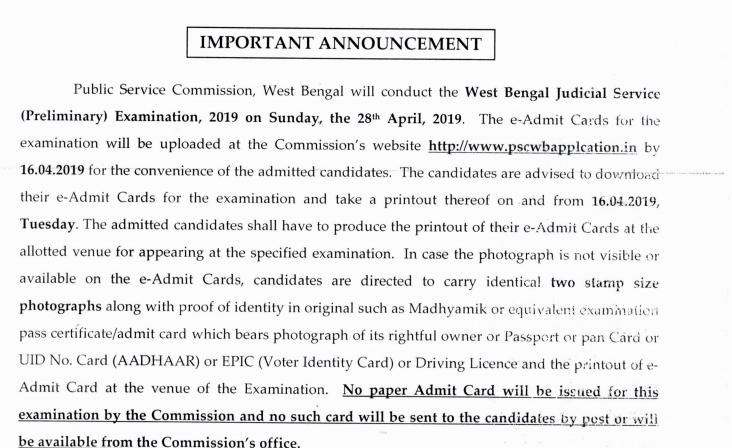 At the below of this page, we had provided the exact West Bengal Judicial Service Admit Card 2019 link. Candidates need to download the Admit Card by entering the Application Number, Date of Birth details. More details about West Bengal Judicial Service Prelims Hall Ticket 2019 mentioned in the below section. The West Bengal Judicial Service Hall Ticket 2019 is out. Candidates can get the West Bengal Judicial Service Prelims Hall Ticket 2019 from the official site or else through this post. The West Bengal Judicial Service Examination 2019 is going to held on 28th April 2019. Aspirants can also check the examination result on our website Sarkari Recruitment. In the below sessions, we have mentioned the more information about the West Bengal Judicial Service Call Letter 2019 such as information on admit card, the importance of the hall ticket, essential documents for the exam, and steps to download the admit card. In present days the examination board has generated the admit card or hall ticket for every examination process. Hall Ticket contains the details of the aspirant and exam. Without taking the West Bengal Judicial Service Hall Ticket 2019, the aspirants will not permit to write the exam. With the help of the admit card or hall ticket the duplicate applicants will catch easily by the commission. Aspirants must carry any documental proof like Aadhar card, voter id, etc. along with the hall ticket to the examination theater for the security purpose. Every aspirant needs to attend the examination center before 20 minutes for the exam. After the examination time, no candidate will not enter into the hall. Before starting the exam view the instructions behind the admit card or hall ticket. The West Bengal Public Service Commission will declare the admit or hall ticket for the Civil Judge (West Bengal Judicial Service Examination). Aspirants who had completed the registration process for WBJS Civil Judge positions and be waiting for the West Bengal Judicial Service Admit Card 2019, it will be good news for everyone. Every year the organization had released the notification for recruit the candidates for filling in various positions. And in this year also it issued the information for the Civil Judge positions. The West Bengal Civil Judge Admit Card 2019 is accessible on this page to download. The organization officially uploaded the admit card on their website. The aspirants who have qualified in the initial exam will be only eligible for the Main exam. In most of the organizations for the examination process, the admit card had released ten days before the exam. So who will attend the exam must download the admit card ten days before the exam from the organization website. After finishing the downloading process, the admit card or hall ticket the aspirants must check the information in that. If the contenders find any corrections then immediately inform the organization. The selection procedure for the West Bengal Public Service Commission will be based on the Preliminary Exam, Main Exam, and the Personality Test. Initially, the management conducts the prelims exam after the candidates qualified in the exam have to attend for the main exam. The applicants who have selected in the main exam will be followed by the personality test. Go through the official website of the WBPSC for more recruitment process. Log in to the official website of West Bengal Public Service Commission, pscwbonline.gov.in. Then the official page of WBPSC will display on the screen. Now click on apply various posts option which is available on the top left side. Find the admit card tab on the official page. Look for the West Bengal Judicial Service Admit Card 2019 link. Hit on the admit card link. The registration details page will open. Enter the particular fields like application number and date of birth. The West Bengal Judicial Service Prelims Hall Ticket 2019 will be redirected on the screen. Save it and download the hall ticket. Take a computer print out of the admit card. Submit West Bengal Judicial Service Hall Ticket 2019 with the identity at the examination hall. The above page represents the data about the West Bengal Judicial Service Admit Card 2019 is useful for the candidates who have applied for the Civil Judge position in West Bengal Public Service Commission. For more updates on recruitment, syllabus, previous papers, admit card, result, answer keys, etc. follow our site sarkarirecruitment.com. The applicants have any queries in this post then immediately leave a comment on below comment box for further clarifications.